Goshen, Indiana is known as the Maple City because of its many maple trees. The city offers many diverse cultural, educational, employment and recreational opportunities. Most notably, we maintain our small town values and charm while offering a multitude of activities and experiences often found in nearby larger cities. Goshen was named the 2017 Indiana Community of the Year by the Indiana Chamber of Commerce for its amazing arts and entertainment, food scene, recreational opportunities, outstanding schools, cultural diversity and entrepreneurial spirit! It is also a “City on the Go”! On the First Friday of every month – throughout the year – businesses, artists, and entertainers throw a party (with great attendance) in downtown Goshen. Hours are generally from 5 to 9 p.m. The amazing thing about Goshen is that dissimilar groups of people work together to make our small city spectacular. The unsurpassed student achievement, remarkable kindergarten through graduate school programs, strong business base, vibrant downtown, solid neighborhoods and thriving arts and entertainment scene reflect our community’s uncommon willingness to collaborate. Check out more stories and videos about the awesome things happening in Goshen at goodofgoshen.com! The college has a partnership with the Interurban Trolley so that all GC students and employees can ride the trolley for FREE just by swiping your current Goshen College ID card. The Red Line Trolley stops along College Avenue on the north side of campus, running every 30 minutes Monday through Saturday. Use the trolley to get to school, work, shopping, the train station or appointments in Goshen and Elkhart. Get more information about routes and schedules at interurbantrolley.com. 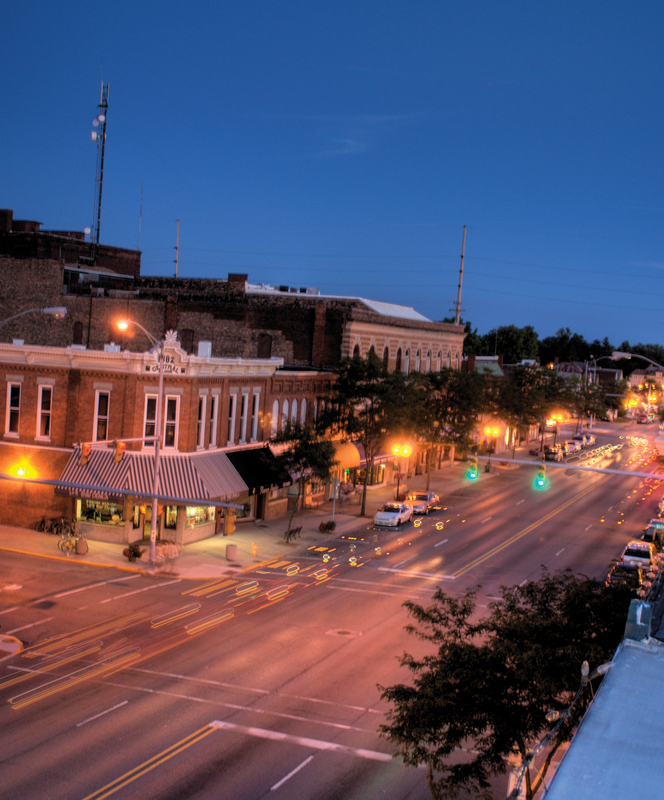 Today, Goshen is a city of around 32,000 residents nestled in the center of the northern Indiana county of Elkhart. The community is growing quickly, with the city gaining over 6,000 residents during the 1990s. Through our growth over the past 25 years, we have become an ethnically diverse community providing residents an opportunity to interact with people from many different cultures. For more information about the Goshen area, stop by or call the Goshen College Welcome Center at (574) 535-7566 or email: welcomecenter@goshen.edu. The text above was excerpted from the Goshen Chamber of Commerce website, Living & Working: Community Profile. Biking and walking trails – the Maple City Greenway is a separated bicycle and pedestrian network throughout the City of Goshen. Connecting residential areas to city parks, schools, downtown area, the college and town library. A large portion of this trail runs along the scenic and historic Mill Race and by the Powerhouse which once generated the town’s electricity. The City of Goshen was awarded Indiana Bicycle Coalition’s “Bicycle Friendly Community” in 1999. For more info – visit Indiana Cycling Coalition. Maps of local trails are also available from the student life office. In addition to the many local parks the South Bend River Walk is a modern walkway that runs along the St. Joseph River in downtown South Bend. Beaches – Warren Dunes State Park and beaches along the Lake Michigan shoreline are northwest of GC about a 1-1.5 hour drive depending upon which beach is your destination. Boating/Sailing – on Lake Michigan and other nearby lakes. Canoeing – rentals are available at the College Cabin to paddle on the Elkhart River … just a few minutes from campus. Also, both private and public canoe rentals are located throughout the northern Indiana area for canoeing on the St. Joseph River and local lakes. Dancing – weekly Ballroom, Latin, Swing and West Coast Swing and a monthly Contra Dance downtown. Kayaking – both private and public kayak rentals are available for paddling on the St. Joseph River, local lakes and on the East Race Waterway. Tennis – courts are available on campus as well as at several local parks. Ultimate Frisbee / Frisbee Football – on campus intramural team, Marcel Yoder Frisbee Football, the Goshen Ultimate Summer League, and the Michiana Ultimate Summer League. Volleyball – on campus intramural teams include: All-Dorm Volleyball, Coed Volleyball and 4-4 Sand Volleyball. Whitewater Rafting – East Race Waterway is the first artificial whitewater course in North America and one of only six in the world. Within a 45 min. drive to South Bend, Ind. What would a college town be without the local brewery… of coffee, that is. Goshen has its charming Electric Brew, which serves as a meeting-place, study area, hangout and weekend musical venue. 136 South Main Street, (574) 533-5990. Just down the road from the college (within walking distance) is the South Side Soda Shop and Diner, featured on the hit Food Network show, “Diners, Drive-Ins, and Dives.” 1122 South Main Street, (574) 534-3790. Downtown Goshen offers a variety of good eating options too: from authentic Mexican cafes to a tapas restaurant to a European bread bakery to several pizza eateries. Many more dining options exist within a 10-40 minute drive from campus. If you like to shop or enjoy artwork, the Old Bag Factory has 19 unique shops and cafe. This is a nice spot to look for gifts or just to hang out. 1100 Chicago Avenue, (574) 534-2502. And of course, there is Goshen’s home of cutting-edge theater and music, New World Arts. 211 South Main Street, (574) 535-7777. There is the nearby Linway Plaza Cinema that shows first-run releases on multiple screens. 514 West Lincoln Avenue, (574) 534-8728.